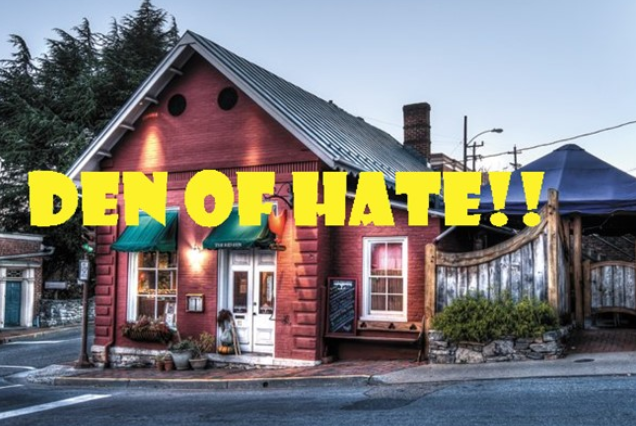 The appropriately named Red Hen, as in communist red, located at 11 E. Washington St, Lexington, Virginia, is the restaurant that kicked out Presidents Trump’s strong willed Press Secretary, Sarah Huckabee Sanders for having conservative political views. Sanders left with her family that included her three young children. A militant gay cook at Red Hen, Matt Adams, is the one who called far left owner, Stephanie Wilkinson, who was off site at the time. He notified her that Sanders was a patron. Wilkinson quickly drove to the restaurant to verify what was reported to her. Indeed, Sanders was in her place of business. It wasn’t just the owner that wanted Sanders to leave. She was called because some employees objected to her presence. From the gay website, the Advocate, a title of an article proudly reads, “Gay Employees of Virginia Restaurant Urged Removal of Sarah Huckabee Sanders,” as though to pat their collective backs for a win against what’s good, moral, and right. As reported by the Chicago Tribune, Wilkinson and company knew that the “restaurant and its half-dozen servers and cooks had managed to stay in business for 10 years by keeping politics off the menu,” but they put reason aside to send a message to Sanders, President Trump, and the American people. Of course they were uncomfortable. Darkness in people’s soles, such as when they regularly engage in sexual sin, weighs heavy on the sinner. Darkness shuns the light as a hard thing to endure so they must strike out to oppose it. After being interviewed by the Trump hating Washington Post, Wilkinson, who has been a visible local activist, went into hiding after she created this controversy. At 4:30 PM on Saturday, patrons with reservations at the restaurant received an email indicating it wouldn’t be open for its regular 5:00 PM to 9:30 PM dinner shift that evening. Apparently not all publicity is good publicity. In this rural community of 7,000, so much for the restaurant staying out of politics. With one bigoted statement they put themselves in the middle of an ongoing national moral debate. Ever graceful, Sanders, with her entourage of one third of the patrons, politely left the restaurant never to return. She left with every Trump supporter who ever graced that place or who, in the future, would have gone. 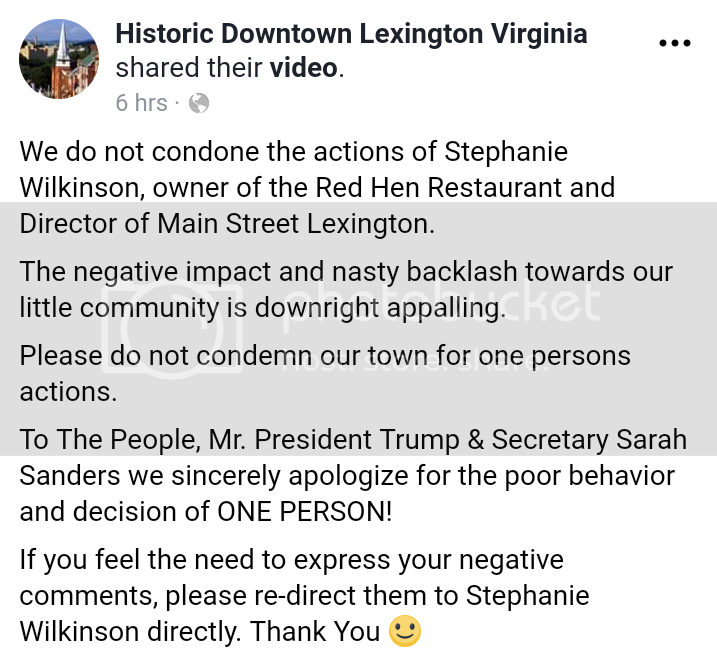 “We do not condone the actions of Stephanie Wilkinson, owner of the Red Hen Restaurant and Director of Main Street Lexington. “The negative impact and nasty backlash towards our little community is downright appalling. “Please do not condemn our town for one persons actions. “To The People, Mr. President Trump & Secretary Sarah Sanders we sincerely apologize for the poor behavior and decision of ONE PERSON! No, things are not looking good for Wilkinson. She’s probably wish she could take back the whole incident. Forget about what she said to the Washington Post where she said she’d do it all again. Historic Downtown Lexington Virginia organization held a 24 hour poll on their Facebook page. 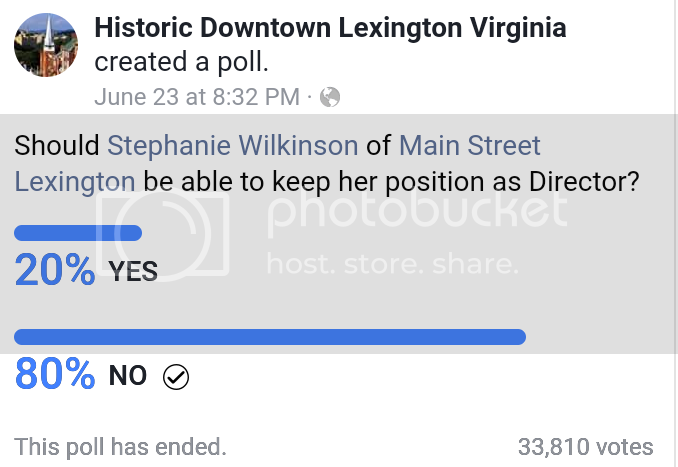 The question was, Should Stephanie Wilkinson of Main Street Lexington be able to keep her position as Director?” With 33, 810 votes in, the response was 80% No and only 20% YES.